Starting Today, Your Clients Are Multi-Channel Marketers. 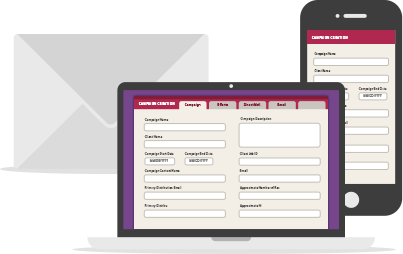 SnailWorks is a powerful, easy-to-use multi-channel marketing solution that you can sell directly to your clients. It's a solution that allows them — and you — to move into integrated marketing while embracing direct mail. Plus we provide branding and marketing support, and sales tools as well. For a small up-front investment and small monthly licensing fee, you get a branded web site, , marketing materials, and access to the SnailWorks platform. We even kick in 100,000 pieces of mail tracking. You still handle the production and mailing for each project, while we manage the coordinated piece at the level you need. Usage fees are modest and allow for excellent margins. "SnailWorks is an easy way to offer your clients a multichannel solution without adding an staff or learning how to use a new software platform, SnailWorks customer support is great and the do all the work." Build your direct mail volume while adding new services. SnailWorks gives you the tools to add integrated marketing services to your value proposition. You make your clients’ mail more effective, hold on to your traditional revenue base, and allow your clients to take advantage of sophisticated new marketing tools. No need to invest countless IT dollars and resources; learn a new software system; or spend hours watching and tracking customer activity — we do it all for you. Add the world’s most affordable multi-channel marketing department to you company – become a SnailWorks reseller! "We help you get started and stay with you every step of the way. SnailWorks is known for their amazing customer support"